Sushi has always mostly been a takeaway thing for me. But then, after having tested most of the sushi places on Nørrebro, I started getting my raw fish on rice at Takii’s. It didn’t take many takeaway pickups before it was obvious that this was a popular eat-out spot as well. The interior is not the attraction: clean-cut, verging on the generic. More likely it’s their all-you-can-eat concept. On weekends the price is just under kr. 200; on weekdays a little less. It’s a good idea to call ahead: the restaurant is almost always full, and I’ve seen people sent away on an ordinary Thursday night because they didn’t have a reservation. Settle in at your table, study the menu and hand in the order form with your choices to one of the nice waitresses. When they bring you your food, you get a new order form. Don’t be greedy. There’s no shame in ordering 3 or 4 times. 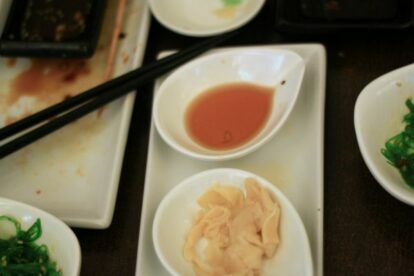 To avoid food waste the restaurant policy is that if you leave more than 3 pieces of sushi on your plate, they charge you an extra kr.10,- per piece besides the three pieces. In addition to sushi you can choose sticks, small hot dishes and various side orders, and depending on where in the restaurant you are seated, you can follow the preparation of food in the open kitchen. So now, whenever I want sushi, I book a table at Takii. It’s so much more fun than take away!